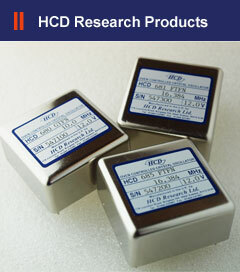 HCD Research is a UK based company that has specialised in the design and manufacture of oven controlled crystal oscillators (OCXO) for over five decades. Our OCXOs are recognised throughout the world for quality and performance and are manufactured in the UK to the highest standards. Each individual OCXO is tested and setup independantly to ensure the most accurate, consistant output possible. Our standard products meet a broad range of specifications and we also have the skill and capability to tailor bespoke solutions if required.